UPDATE!!! 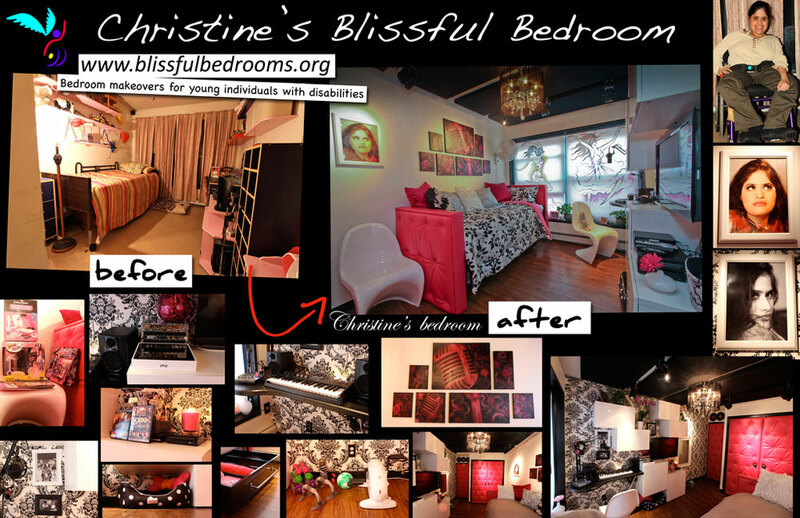 During the weekend of 2/24-2/26/12, A team of Blissful Bedrooms volunteers – TEAM CHRISTINE – gave Christine the Pop Star/Recording Studio themed bedroom of her dreams! Twenty-seven dedicated and talented individuals made Christine’s passion their own, and physically and creatively contributed to this act of loving kindness. Countless other individuals made donations to invest in Christine’s happiness – CHRISTINE’S ANGELS, making it all possible. Christine’s room is now a totally cool, completely unique, “grown-up” bedroom fit for a Diva. She has a sanctuary, of which she was the ultimate visionary and designer, a place where she can retreat to and feel rejuvenated, happy, inspired and peaceful. Even more remarkable than that, we wrapped our collective arms around Christine and her family, and left their home with a palpable and all-pervading, loving and compassionate energy that is guaranteed to linger for a lifetime, and send ripple effects out into the world. The joyful and confident smile Christine wears on her face these days is the highest compensation we could ever hope for! Christine, may all of your days be blissful and may you sing your heart out in your Blissful Bedroom! Christine is a beautiful 21-year-old female who has sad eyes, and a sweet and demure smile that gives her a mysterious quality, and often makes one curious about the deep thoughts she is pondering. She is extremely articulate, vocal and social. In fact, she has a flair for drama and it’s always an adventure to hear her stories about the passionate and complex relationships in her life. In her social circles at school, she tends to be the peacemaker among her friends, and she admits she just likes to see people happy. Christine is challenged with Spina bifida, a birth defect that involves the incomplete development of the spinal cord or its coverings. Spina bifida occurs at the end of the first month of pregnancy when the two sides of the embryo’s spine fail to join together, leaving an open area. In some cases, the spinal cord or other membranes may push through this opening in the back. There are different types of Spina bifida – the type that Christine was born with has resulted in her being paralyzed below her waist, in addition to other associated impairments, including severe scoliosis which requires a custom-made modeled seat for her wheelchair. Christine also suffers from alopecia (thinning/loss of her hair), which no doubt affects her self-esteem. Christine lives in an apartment, in a low-income housing development in the Bronx, with her mother and father, two yorkshire terriers named Rosie and Chucky, and a parrot called Skippy. She says her father is her hero and it didn’t take long for us to understand why that is true. Christine’s bedroom is on the second floor of their apartment, and every day her father carries her up and down the stairs with the tenderness and loving disposition of a doting father. You see her apartment is not wheelchair accessible, and in fact there is only one that is in the entire housing complex. It seems that this problem can be easily remedied by installing a “electric stair chair” on the inside wall of the stair case, but of course that takes ample funding which is not available to this family. Christine’s mom says that they have been living in that apartment for 29 years and they are not looking to uproot, so they do what they have to do. However, they confess it is not easy, as Christine is now a full-grown adult and they are feeling the aches and pains in their aging bodies of the physical requirements associated with caring for Christine for the past 21 years. Christine says that she loves her parents dearly, but like any typical young adult, she needs her private time and so spends a lot of time in her bedroom. She shares her bedroom with her dog Rosie, who loves to sleep with her at night. In fact, her pup even has her very own bed right next to Christine’s. So we have two divas to make happy with this bedroom makeover! This coming June, Christine will be graduating from a New York City Special Education school. She has not received vocational training, so she is not equipped to get any sort of job. As of yet, she is not lined up to attend an adult day program. Sadly, this means that Christine will be spending more time than ever at home, in her bedroom. Christine is extremely excited about her upcoming bedroom transformation, which is scheduled to take place during the weekend of 2/17-2/19/12. She loves music and it is her passion to sing and perform. In fact, she rarely misses the opportunity to star in the talent or holiday show at her school. When she is not on stage belting out her favorite tunes, she can be seen wearing headphones, singing and bopping along to the music. Her most loved genres of music are Hip Hop, Pop and R&B. One her all time favorite artists is Jennifer Lopez. Christine loves the way she sings and dances, and she says she can relate to her because she came from the same neighborhood in the Bronx. She also loves Rhianna, Beyonce, Mariah Carey and Lil Kim. Christine told us her dream is to meet one of her favorite artists in person one day and maybe jam out with them. Naturally as an entertainer, Christine loves fashion and she stands out from the crowd with her french manicured nails and clothing choices, which are always topped off by the coolest and funkiest accessories, whether it be a stylish cap or glamour girl sunglasses. She adores handbags and hats and admits that she can never have enough of these two items. Christine also confided that she loves diamonds and has an attraction for shiny and sparkly jewelry. She was too humble to say she is an aspiring fashion designer, but shared that one of her favorite pastimes is drawing different ideas for clothing styles. Her favorite TV show is 106 & Park on BET and naturally as a music lover, she enjoys watching MTV. When we asked Christine what she wanted her dream bedroom to look like, she said that she wanted it to be a recording studio with the theme strongly related to her passion for music and singing. She explained that she has had the same room since she was a little girl, and now she is ready for a “grown-up” room to reflect the woman she has become. While she doesn’t want her room to be the bubble gum pink color it is anymore, her feminine side doesn’t want to let go of the pink altogether, rather she wants a shade that is deeper and more mature. Christine looks forward to being able to invite her friends over to her new bedroom so they can chill out in her new space, make music and sing together. Blissful Bedrooms can’t wait to give Christine a dream bedroom that she can feel inspired, peaceful, happy and “grown-up” in for years to come. Please help us give this very special young lady her own recording studio/music mogul bedroom by making a donation of any amount today. Please do not hesitate to get in touch if you would like to be involved in Christine’s bedroom makeover and/or if you have any resources or ideas you would like to share. Thank you for helping us to spread love, peace and happiness one bedroom at a time! Please take a few minutes to view the photos from Christine's makeover weekend, which include Before & After photos of her bedroom, pictures of the details and original art work, her reaction to the Revealing of her bedroom, the process of transforming the bedroom and the Reveal party celebration with past Blissful Bedrooms makeover recipients, friends and supporters. On a crisp and chilly February afternoon, Christine's Mom and Dad escorted a very excited Christine to Manhattan for her Pop Star photo shoot. John of John Kilgore Sound & Recording opened up his heart and his doors to Christine and Blissful Bedrooms, and was extremely welcoming to us during the 3 hour photo shoot. With high profile stars utilizing his studio all of the time, we are very humbled and thankful that he donated this valuable recording studio time to rising star Christine. It is obvious as a seasoned professional, he recognizes true and lasting talent and stardom when he sees it! When the photo shoot team arrived at the studio, they found Christine eagerly waiting outside looking all cool and cute and making it apparent that this is one celebrity who doesn't need a stylist. Christine easily transformed into her Pop Star persona, completely at ease in the recording studio environment, and very natural as if she had done this a thousand times before. You know the old saying, Stars are not made, they are born!! Christine was made even more beautiful and glamourous then she already is by the very talented and elite Makeup Artist Andrew Sotomayor. Straight off the intensity and exhaustion of Fashion Week, Andrew volunteered his time for this photo shoot and gave Christine the same attention and enthusiasm as if he were working with Rhianna, Beyonce or Lady Gaga. Christine and Andrew chatted and laughed the whole time and Andrew not only made her eyes smoky and sultry, but also brought her inner glow out even more. Brian Golub was the volunteer Creative Coordinator for the event and he made sure every detail - big and small - was perfect for Christine's shoot. He scouted and arranged a location for the shoot, brought lighting and props, and sang and danced for Christine just to make her giggle. Martha Gold-Dvoryadkin was the Photographer's Assistant and the Stylist and Prop Coordinator for the shoot. Her job was extremely easy as Christine looks great in everything she wears. Finally, Alex donned one of his many Blissful Bedrooms hats this afternoon - in fact his favorite hat of all when it comes to the Blissful Bedrooms makeover recipients - that of Photographer. He did a great job and manifested some great shots of Christine, which are now displayed proudly in her brand new bedroom! Thank you to the Christine's Photo Shoot Team for dedicating your afternoon to Christine, and contributing to making her spirit and self-esteem soar to new heights. Thank you to all of the volunteers who donated their time and talents to make a dream come true for Christine! Thank you to all of the generous ORGANIZATIONS/BUSINESSES and INDIVIDUALS who have supported Christine’s bedroom makeover by donating funds, services and/or materials. This makeover could not have been possible without your help! Thank you to the Companies and Individuals who have adopted Blissful Bedrooms donation boxes, and to the generous and giving customers/people who contributed to the boxes. You helped us manifest Christine’s dream bedroom!